Hyperbaric oxygen therapy (HBOT) is a natural way of maintaining general health and well-being as it promotes the release of stem cells from the bone marrow. This increase in the stem cell concentration in the body ensures healing and rejuvenation of organs and repair of bone, vascular and nervous tissue. This mechanism is also responsible for the shortened recovery time after surgery, injury or strenuous exercise. Research shows that many illnesses connected with aging can be avoided or slowed down through optimal cell health. Studies show that oxygen levels in arterial blood in a 70 year old are 20% lower than in a 30-50 year old. Chronic lack of oxygen can cause progressive nerve cell death (seen in Alzheimer’s Disease). Dr. Paul Harch, in his book entitled “The Oxygen Revolution” argues that hyperbaric oxygen therapy will likely become the fountain of youth by the baby boomer generation whose life has been compromised by years of drug experimentation in the 1960s and 1970s. Dr. Harch says, “Hyperbaric oxygen therapy will be able to restore waning brain function and prevent premature dementia”. Adding extra oxygen fights chronic conditions, especially inflammation and is very important in improving brain circulation and brain activity. On a longer scale, hyperbaric oxygen therapy provides neuroprotection by stimulating oxidative cerebral energy metabolism. Hyperbaric oxygen therapy optimizes the white blood cells’ killing capacity, boosting the body’s immune system and improves blood circulation in all other organs, promoting detoxification and rejuvenation. Oxygen promotes bone mineralization and increases bone density. Additional oxygen initiates regeneration of damaged nerves due to age or injury giving a general relief of pain, swelling, cramps and numbness. 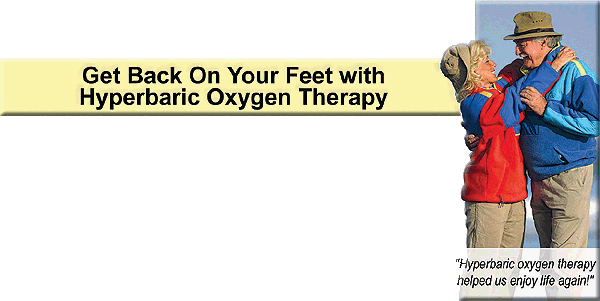 Hyperbaric oxygen therapy bolsters the growth of new blood vessels in tissues promoting healthy bodily functions and greatly boosts the body’s metabolism making one feel energetic and invigorated. Inadequate oxygen level will cause cell death and organ malfunction which is aggravated by age, injury and illnesses. Adequate oxygen levels in your body will keep you in balance. Oxygen under pressure stimulates blood flow to the largest organ in the body, the skin. Hyperbaric baric oxygen therapy is a safe and effective anti-aging remedy as it nourishes the skin cells and strengthens the skin’s collagen structure further preventing the appearance of age spots and protecting from the damaging UV radiation. In cosmetic surgery Hyperbaric oxygen therapy minimizes scar tissue formation and speeds up surgical wound healing, as well as prevents complications. As HBO is a natural antibiotic, it can suppress the growth of bacteria, viruses and fungi making it useful for controlling skin infections like acne and seborrheic dermatitis. Today’s hectic and stressful lifestyles with environmental pollutants, pesticides, fast-food diets and reduced activity has lowered our immune system and our body can easily be struggling hard to maintain an acceptable flow of oxygen. Reduced oxygen content slows down the exchange of the nutrients and metabolic byproducts which can accumulate and become toxic. Red blood cells instantly bind extra oxygen and the rest dissolves directly into the blood plasma, building up tissue oxygen levels far above normal in just a few minutes. A higher (>20 times than normal) partial pressure of oxygen in the tissue will effectively drive out the toxins and heavy metals. Reduces pain, swelling, tingling, cramps and numbness. 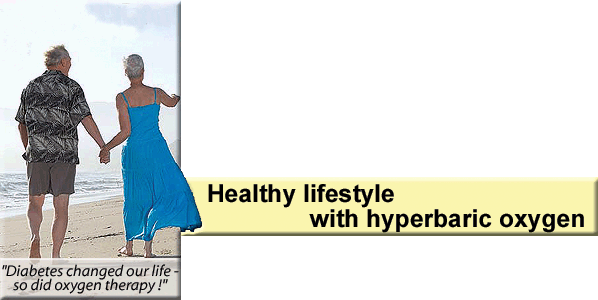 "After hearing about and doing some research about hyperbaric treatment program I believed it would be a great benefit to my overall health and well being. Having issues with digestive problems etc. I have felt that the four treatments that I have taken have been very beneficial to me and the professional care and guidance are excellent."